Regardless of how you feel about the commercialisation of public and religious holidays in the UK, it can’t be denied that Easter is big business. The link between the death of Christ and the consumption of vast quantities of chocolate delivered by a rabbit are tenuous at best. Cadbury’s are doing their best to distance chocolate from religion in secular Britain with their latest ad campaign featuring a bunny on a bike delivering chocolate to expectant children like a smaller, more hirsute Springtime Santa. These days, Easter Eggs are on supermarket shelves as early as the period between Christmas and New Year, driving consumer demand. But we’re not here to talk about religion thank God, or Allah, or Buddha…..
What we are concerned with, however, are the frankly abhorrent conditions endured by those who farm the cocoa beans without which Easter would simply revert back to being the most significant festival of the Christian calendar. Big companies such as Nestle profit from child labour in West Africa with farmers earning as little as 50p a day, certainly never experiencing the end result of their toil. Chocolate is interesting from an ethical standpoint due to its popularity and the methods used to make it. Its production affects animals and the environment as well as human beings. This is why so many of our list are vegan and organic, although we must stress, not all of them! With this in mind, we have compiled a list of our top five ethically produced Easter Eggs available in the UK. Plamil have been Vegan pioneers since the 60s, when they created a dairy free alternative to milk. Their Easter Egg is also available in a no added sugar version. 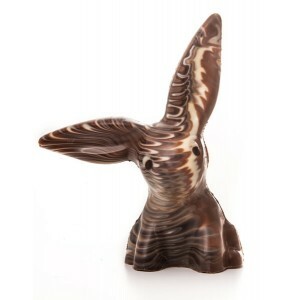 Not a traditional chocolate Easter Egg, we love the offerings from Booja Booja. These are hand made egg shaped cases made to house their delicious truffles. Hand made and painted in Kashmir, adhering to their fair trade policy and then stuffed with with either 3 (£9.99) or 12 (£24.99) dairy, gluten and soya free truffles and come in 3 delicious flavours. Stockists include Waitrose and Holland And Barret. Produced in the UK, these guys have a great selection of products. All chocolate is organic and fair trade, with a good section of dairy free. Buying organic chocolate encourages fair trade practises. Check out their website for the full range. Using rice milk instead of cow’s milk, Moo Free claim their chocolate is just as good as the conventional stuff. 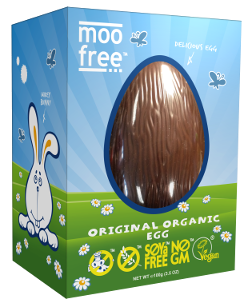 Marketed primarily at kids, Moo Free chocolate is organic, vegan, dairy free, gluten free and soya free. Perfect for those who have kids with allergies but don’t want them to miss out. Available in milk chocolate, honeycomb and orange. With a history stretching back to 1993, Divine are fast becoming a well recognised brand. Pioneers of Fair Trade chocolate, 44% of the company is owned by the cocoa bean farmers. Their packaging is fantastic and the brand is widely available, although we couldn’t find their Easter specific products anywhere other than on their own website.